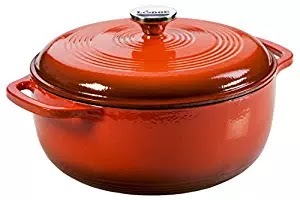 HURRY over to Amazon where you can score this highly rated Lodge 6-Quart Enameled Cast Iron Dutch Oven in Poppy or Grey for only $39.99 shipped! This 6-Quart Dutch Oven is made of enameled cast iron and is ideal for stove top cooking, baking, refrigerating and freezing. The chip-resistant porcelain enamel finish eliminates the need to season the cast iron and it is oven-safe up to 500 degrees and hand washable.